Let me just start by saying that I absolutely love relaxed hair. Maybe I should rephrase that, I absolutely love HEALTHY, relaxed hair. Relaxed hair will always have a special place in my heart simply because I myself have relaxed hair and have had it for as long as I can remember. I have learned through experience (which is not the best teacher in many cases), and through cosmetology school that taking care of relaxed hair is critical to the hair's overall health. The steps to taking care of your relaxed hair are not hard, but they must be done if you want your relaxed hair to actually grow and remain healthy. One of the main things you absolutely must do to your relaxed hair is to stop relaxing it yourself. This is a big no-no. I'm talking HUGE! I know that when you look at a professional do relaxers, it just looks so easy and when the day comes where it is time for your touch up but your money is looking funny and you can not quite make it to the salon, that self hair relaxer kit in a box does not seem like a bad option. But when is the last time you actually looked at the directions on those relaxers? Did you even know that there is a certain time limit (8-13 minutes) that you must get the relaxer processed through your hair? And by processed I mean applied to the hair and worked all the way through. Don't get me wrong, I am guilty of trying to relax my own hair in the past (before I even thought about becoming a professional hairstylist) and I will be the first to admit that it took me 8-13 minutes just to base my scalp! So we all know that those of us that have tried to relax our own hair far exceed that time frame. Yet we wonder why our relaxed hair looks brittle, will not seem to grow, and just looks overall damaged. I am telling you what I know for a fact, you should never relax your own hair at home. Even now that I am a professional hairstylist and have been properly trained on how to apply a relaxer, I still do not do my own. Why? Because when you know better, you do better! Cosmetology school taught me everything there is to know about relaxing the hair, how the hair is broken down where the line of demarcation is, and everything in between which is how I know that most people who do their own relaxers really don't know what they are doing. If you understood everything that goes on when a relaxer is applied, you would only let it be done by a professional. 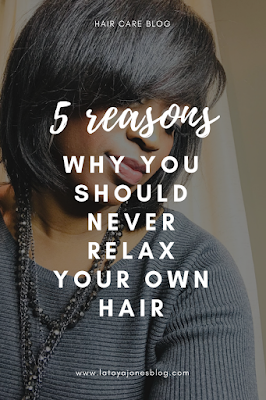 Today I want to give you four reasons why you should never relax your own hair at home. Let's get started! You can not do it in the proper amount of time-I briefly covered this already. Any time you go over the proper amount of time you are causing more damage to your hair. The next time you are in the beauty supply store and are thinking about how to do your own relaxer at home, read the directions on the back of the relaxer kit. Pay close attention to the time frame that the relaxer is supposed to be completed. Then ask yourself can you really do it in that time frame without rushing, because rushing means you will be so worried about getting it done in enough time that you won't be very effective with the results. You are overlapping and in essence over-processing- While it may not seem like you are doing any damage to your hair at first, trust me when I say you are. When you are at home doing your own relaxer, you can not see where your new growth ends and your relaxed hair begins. This means that you simply take a good guess, and in doing so you more than likely go well beyond your line of demarcation (the line where your relaxed hair meets the non relaxed hair). Some of you even go all the way to the ends of your hair each time (that is another post altogether). Over time, continuously crossing that line of demarcation causes the hair to become thinner and more brittle, allowing to break easier. You can not see what you are doing- Once you get to the middle and back of your head you can not see what you are doing! How can you tell not only where the line of demarcation is, but if you are even processing everything that needs to be processed? So, in addition to over-processing and over-lapping, you end up with some hair that could be under processed. You are not a professional!-We (professional hairstylists) have been trained to apply relaxers the correct way AND in the right amount of time! Let us do our job and leave the chemicals to us. You don't know what to do in the event something goes wrong- This goes to my point about not being a professional. Not only are we taught to do relaxers correctly, we are also taught how to fix any problems that may arise unexpectedly. Relaxing your own hair can be very enticing when you are unable to get to a salon, but you are absolutely damaging your relaxed hair by doing this. I have a client who has absolutely no problem with relaxing her own hair and will do it without even thinking twice about it. Yet her hair is very broken, uneven all over, weak, and will not grow to her satisfaction. She will come to me for a shampoo and style but takes the responsibility of handling the chemical on her own. I told her that my professional opinion is that she is doing this backwards. Instead, she should let me handle the chemicals while she handles the shampooing but for some reason she does not put two and two together and realize that there is a direct correlation between her relaxing her own hair and the overall state of her hair. As a result, I will no longer service this client. Why? Because she ignores all of my professional advice concerning her hair, and also because despite all of my efforts to keep her hair healthy she is messing all of that up when she gets home and applies her relaxer whenever she pleases. I simply won't be the blame when her hair begins to break off and she she is able to see the physical signs of her actions! Relaxed hair can be healthy if it is properly taken care of. If you put in the work, the results will be gorgeous, healthy, relaxed hair.